Ricardo Santos shows how much scoring his first senior goal meant to him. Photo: Joe Dent/theposh.com. Peterborough United manager Graham Westley is convinced defender Ricardo Santos will go ‘all the way’ in his professional career. Santos (20) was the unlikely match-winner as Posh won for the first time in eight League One matchs at Doncaster today (March 19). Santos claimed the first goal of his career in the 93rd minute to make amends for a defensive howler which enabled the home side to take a fifth minute lead. Michael Smith in action for Posh at Doncaster. Photo: Joe Dent/theposh.com. 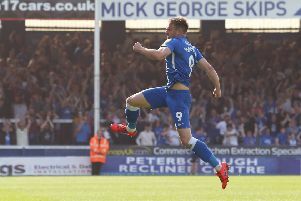 Aaron Williams equalised for Posh in the last minute of the first half to continue his fine start to his Football League career. Posh remain 16th in League One after their 2-1 win, but they are now 11 points clear of the bottom four with just nine games to go. Westley said: “It was great to see a young player show so much character after making an early mistake which led to us falling behind. “But there is no doubt in my mind that Ricardo will go all the way in the game. He has great ability and he clearly has great character. “I was surprised to see him score though as I don’t think I’ve even seen him score in training. You could see what it meant to him. It was a terrific moment for him and for us. “It was a great bounce back by my whole team. We didn’t let the early goal affect us. We kept getting the ball down and we stuck to our passing game and played out from the back. Posh boss Graham Westley salutes the Posh fans after a dramatic win at Doncaster. Photo: Joe Dent/theposh.com. “We deserved to be level at half-time, but in the second-half we had to weather a storm. “Doncaster got their tails up. The crowd got involved and they had a lot of pressure, but we battled away and then we found some forward momentum towards the end. Westley shuffled his playing pack again and named five changes to his starting line-up. Defenders Jack Baldwin and Harry Toffolo were left out to protect niggles. Westley was also delighted with the performance of the Posh fans as over 1,400 of them turned up at the Keepmoat Stadium to support a team in poor form. Westley added: “Considering what we’ve been serving up results-wise, to have support like that was wonderful. One of the reasons why I love working at this club is the unity on and off the pitch, even in difficult times. Doncaster’s former Posh boss Darren Ferguson said his side were ‘devastated’ to lose a game they had dominated in the second-half. He also insisted Doncaster should have had two penalties for holding offences at set-pieces committed by Santos. Ferguson, whose side are now in the bottom four after a 13th game without a win, said: “We would have been disappointed to draw so to lose is devastating for us. “Anyone could see were were the better side in the second-half, but things aren’t going for us at the moment. “We should have had two penalties as Santos kept holding Andy Butler at corners right in front of the referee. “It’s an awful run we are on, but if we play like that for the rest of the season we will be okay. Posh are next in action at home to Coventry on Good Friday (March 25, 7.45pm kick off). A match that will be sceened live by Sky Sports. Both Posh and Coventry will be weakened nby international call-ups. Posh will be without Michael Smith, Gaby Zakuani, Kgosi Ntlhe, and possibly Chris Forrester.